This Bat System - One 12" Round Outer Bat Adapter & Six Rounded Square 7" Inserts allow for the throwing pots with a base 7" or smaller. Fits standard wheel heads with bat pin holes spaced 10" apart (measured from the centers). Each insert can be easily lifted from the insert tab in the outer bat. The outer bats are also easy to slide on and off wheel head bat pins. The outer bat is made out of an exterior-grade wood material, and is very strong and warp- and water-resistant, but it can be damaged with long-term exposure to water. To protect your bat system, do not leave outer bat or inserts sitting in water, and gently clean and dry outer bat and inserts on their sides. 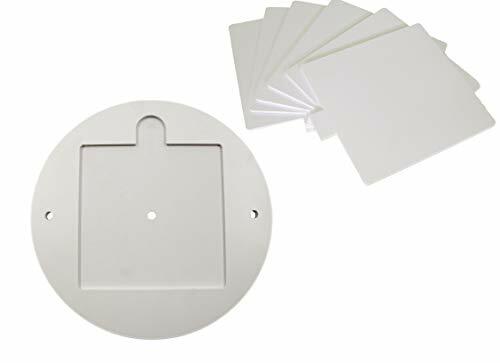 If you need additional inserts, you can order them separately from Amazon at https://www.amazon.com/Inserts-Satin-Additional-Adapter-Potters/dp/B0764MBG57/. EASY TO USE: Bleecker Station's Bat System is easy to use - simply lift inner bats from the insert tab in the outer bat using your fingers or a flat potter's tool. The outer bat has holes drilled through and is also easy and to slip onto and off your pottery wheel pins. Fits standard wheel heads with pin holes spaced 10" apart on center. SAVE SPACE: Save precious space in your ceramics studio by drying your pots on small square inserts instead of regular round bats, which can take up a foot of space or more on your shelves. MORE ENJOYABLE: Masonite absorbs water allowing your pot to release itself as it dries, which is safer than cutting it off the wheel head with a wire and risk deforming or dropping it or leaving your fingerprints on the clay. Make throwing more enjoyable by eliminating the wiring off step altogether! SAFE: Insert tab is wide enough to prevent fingers from getting caught while throwing on the wheel. DURABLE: The inserts are made out of Masonite and the outer bat is made out of a water resistant, durable exterior-grade wood material. This bat system is designed to accommodate swelling from exposure to water, so unlike other bat systems the inserts should still fit into your adapter use after use. This Speedball bat for pottery wheels is the most affordable and dependable bat available. These economical bats from Speedball work with Artista table-top wheels as well as the full line of Boss potter's wheels and many others allowing potters to easily remove their creations from the wheel face, transport and dry them. Measures 11.75" in diameter and 1/4" thick. Performance at an exceptional value. Bats create a base for pottery during and after it is thrown on a wheel. 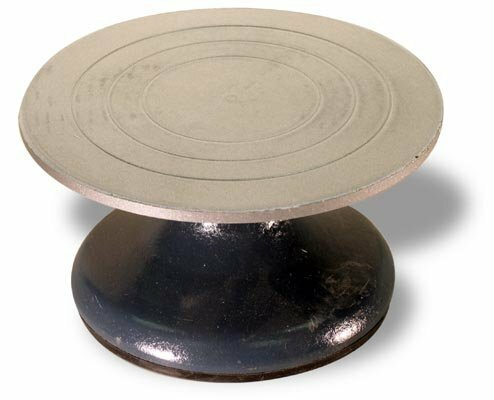 This 14-inch round bat is used during throwing, can be removed from the wheel head and used for temporary storage - without disturbing the new pot. Creative Hobbies BW-18M Professional Sculpting Wheel 7 Inch Diameter, Heavy Duty Solid Cast Iron, Blue Color. Professional Solid Cast Iron Wheel used for decorating, sculpting, carving, cake decorating and hand building. Features sealed ball bearings for smooth turning without wobbling or sticking and rust-resistant blue paint coating. Our Weighted Top is heavier than competitive models and gives the wheel extra momentum to spin longer using its own inertia. Solid, 6.5 Pound weight and our wheel does not come apart when lifted up. The concentric rings make it easy to center your piece on the wheel head. Creative Hobbies BW-18M Professional Sculpting Wheel measures 7 Inch Diameter x 4.24 Inch High. Professional Heavy Duty Solid Cast Iron, Blue Color Wheel used for decorating, sculpting, carving, cake decorating and hand building. Features sealed ball bearings for smooth turning without wobbling or sticking and rust-resistant blue paint coating. Our weighted top is heavier than competitive models and gives the wheel extra momentum to spin longer using its own inertia. 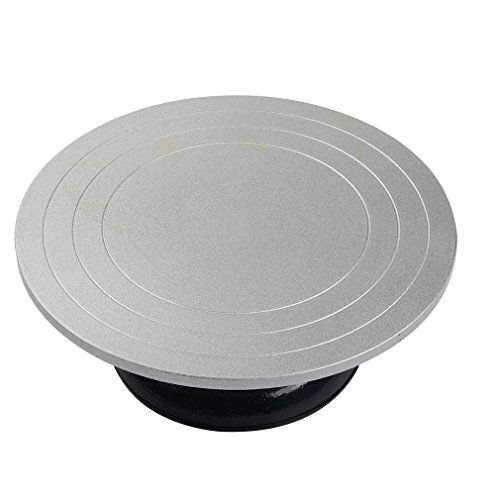 Profession grade Precision machined turntable is wobble free, 6.5 Pound weight and our wheel does not come apart when lifted up. Combining convenience with quality, power and capacity, the Artista Pottery Wheel has it all. The lightweight wheel and compact construction makes it portable and easy to store. Its 25 pound centering capacity makes it a great fit for any studio or classroom. With an 11 inch wheel head, 1/3 HP motor that runs smoothly with very little noise, variable speed hand control (0 to 220 rpm) and a two part splash pan (included), the Artista leaves little to desire in performance, quality and value. For artists who want to move from the tabletop to the floor, static or folding legs can also be added, and for artists who prefer, the Artista can easily be converted from hand operated to foot powered with our plug in foot pedal. Comes with (1) 12 inch round and (1) 7.5 inch square bat along with an instructional DVD. 1.Please not place it on the edge of the desktop. 2.Place in a dry environment to extend product life. 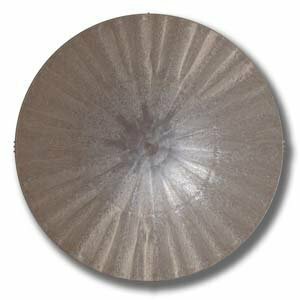 If you are a painter, sculptor or decorator working in ceramics, pottery, floral arranging, model-making, clay design, cake decorating and other artistic work you will find this wheel a perfect choice. 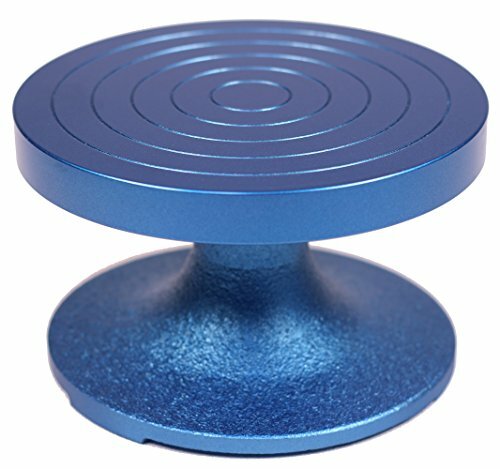 The base and top are all high grade and heavy duty made of nearly indestructible heavy cast metal joined with heavy-duty ball bearings that allow you to spin the top easily. Holds up to 40 lbs. 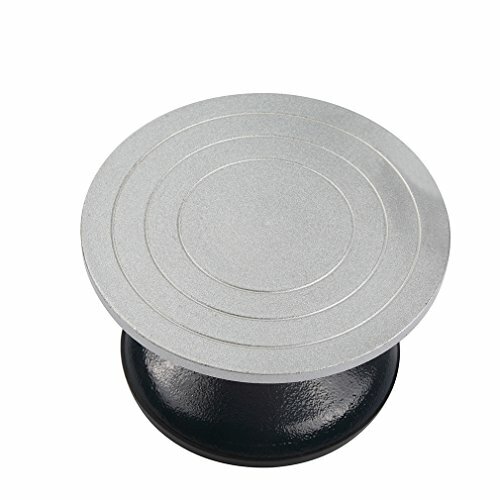 The base has a non-skid rubber boot that holds the wheel firmly in place without the need to drill holes in your work station. 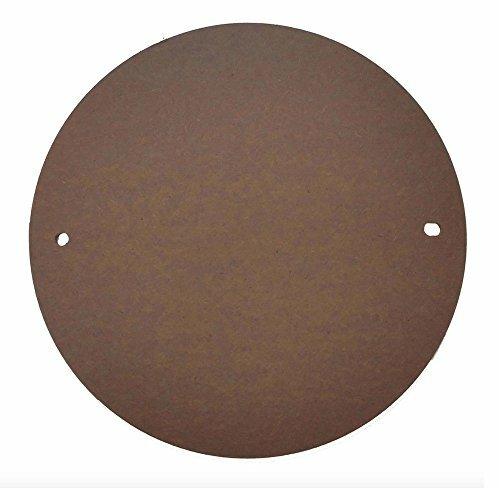 The top is designed with concentric circles to allow easy centering of your work and the rim is weighted to give the wheel extra momentum when you spin it. It is tall enough (3-3/4") for you to get your hand beneath the top so you can rotate it while you work. 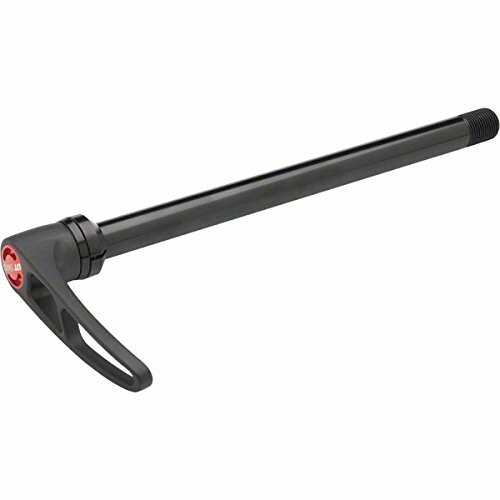 Although it has heavy-duty construction it is still light enough (5 lbs.) so that you can easily move it around when necessary. Cast metal construction will last for years. Concentric circles on top for easier centering of work. 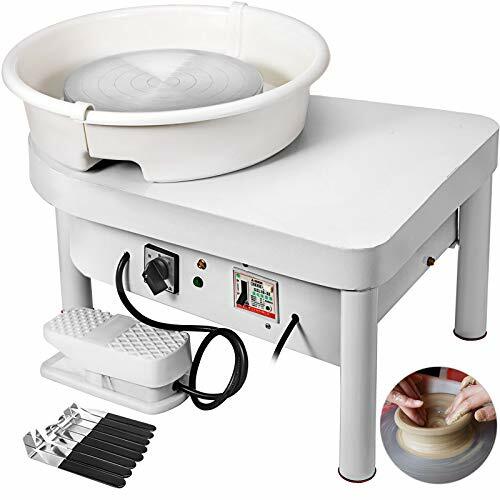 POWERFUL & DURABLE: Professional heavy duty portable table top pottery wheel with a powerful 3/4 hp motor, 11" wheel head and two part slash pan. Holds up to 25 lbs. of clay. LCD SPEED DISPLAY: Easy to use LCD Display that's adjustable by a variable speed control knob or with the foot pedal when it's attached. Max Speed: 300 RPM. INCLUDES FOOT PEDAL: Comes with a foot pedal for hand less operation. Also comes with a 11 plastic bat and a cup. REVERSIBLE SPIN DIRECTION: Adjust spin direction for left or right handed use. 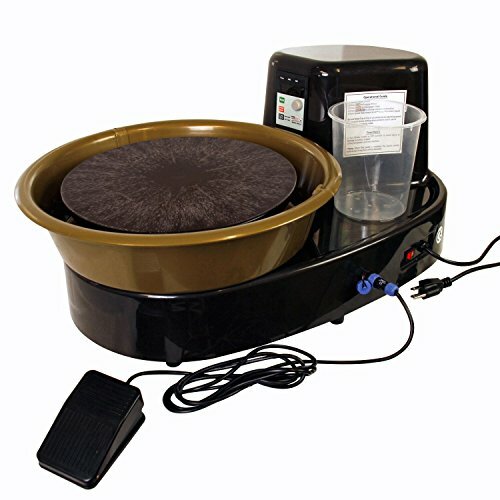 USE FOR ALL SKILL LEVELS: Our durable easy to use pottery is great for use by beginners, but professional also love it because of the power it has for a portable unit. Includes User Guide Manual. 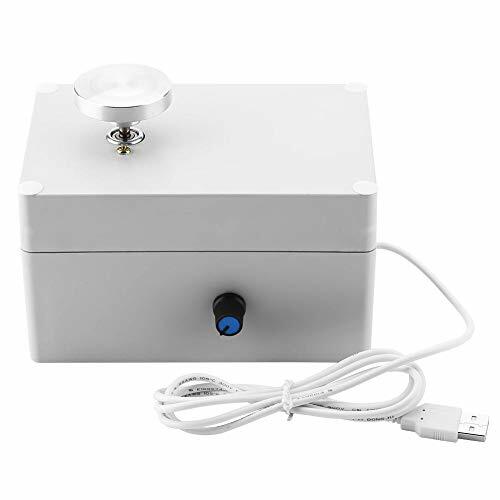 This small professional ceramic wheel machine is especially suitable for school teaching and pottery DIY shop to satisfy professionals and pottery enthusiasts. 1. 25 cm Diameter Wheel Adopts aluminum alloy wheel with large diameter of 25 cm (9.8"), allowing users to draw large pieces with ease. Enclosed design prevents mud from eroding and penetrating into the fuselage. ABS basin is detachable for easy cleaning. 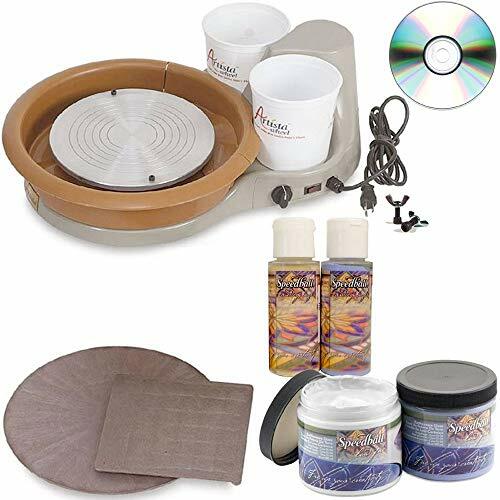 The Boss family of pottery wheels offer sturdy construction and a reversing plug that allows for quick change of wheel head direction, 2 free bats, sampler of Speedball glazes, instructional DVD and a 5-year warranty. 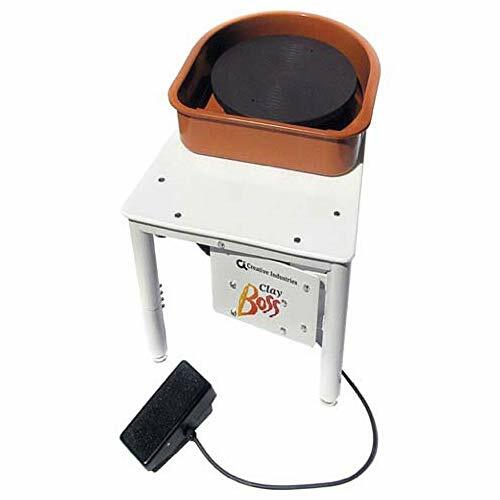 This Clay Boss Wheel has a 1/2 horsepower motor, 100lb centering capacity, 14-inch wheel head and foot pedal with variable speed control, adjustable height feet and a splash pan. Specification reference: Color: Green Wheel material: Aluminium alloy Rated voltage: 110V Rated power: 350W Noise: The direction of rotation: positive and negative direction of rotation Product Size: approx. 500x360x360mm Wheel diameter: approx. 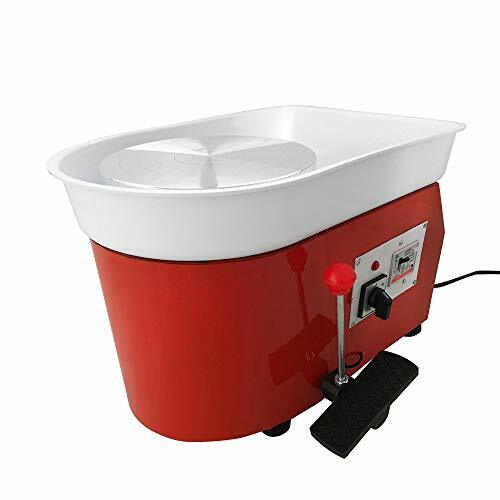 250mm Weight: about 15kg Features: 1.Suitable for school teaching,pottery bar or home use,to meet the majority of professional,amateur ceramic enthusiasts and the development of design Pottery special equipment. 2.Elegant green surface. 3.Compact structure. 4.Small footprint. 5.Good mud blocking. 6.Flexible,safe and reliable operation. 7.Smooth speed. 8.Low noise. 9.Forward and reverse switching. You will receive: 1 x Pottery wheel 1 x Pottery material Accessories Included: Boxwood Potter's Rib x 1 Boxwood Modeling Tool x 1 Ribbon Tool x 1 Sponge x 1 Needle Tool x 1 Loop Tool x 1 Metal Scraper x 1 Wire Clay Cutter x 1  Customer Services: If you have any questions, please leave your messages, we promise to reply you within 24 hours and offer you best services. If you are satisfied with our products, please don't forget to leave 5 stars Positive Comment, we will appreciate your encourage. If you are not satisfied, before you leave the Negative/Neutral Comment, contact us and let me know that, we will resolve the problem till you satisfy. Combining Art and Quality: Beautiful appearance,green Brilliant colors make your mood more enjoyable. The Ceramic wheel machine body spray treatment, compact structure, small footprint, good mud shielding, easy operation.Humanized design, outstanding details, combining art and quality.The fuselage is made of thick steel plate, thickened design, and spray plastic process, making the ceramic wheel machine pressure, beautiful and anti-corrosion. Outstanding Details: The Electric Pottery Wheel Machine adopts the largest diameter aluminum alloy turntable and never rusts. The speed is stable and you can easily draw large pieces of work.Removable ABS basin is easy to clean .Good mud blocking (to prevent mixing chaos rejection).The wheel rotates smoothly, with low noise(< 60dB), and rotation direction can be switched clockwise or counterclockwise. 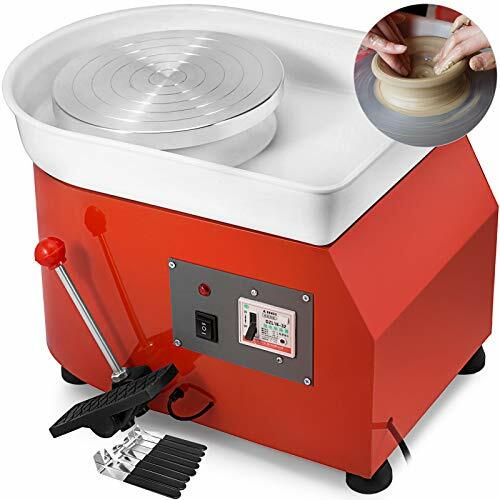 High Quality: The Electric Pottery Wheel Machine has Forward and reverse bidirectional controllers: Bidirectional controllers give you more options. 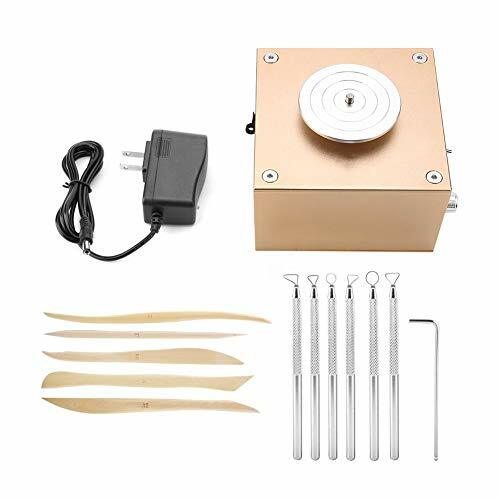 High-quality advanced brushless motor: 0-300 rpm / minute, stable, strong, quiet, long service life.Single-phase three-wire connection with earth leakage protection device, safe and reliable operation.Removable control panel for easy replacement of accessories, saving you maintenance costs. Independent Pedal Design: Independent pedal control speed can better liberate your hands and give you more freedom to play with mud.The foot pedals have a large force-bearing surface for added comfort and flexibility during use.The design of the foot pedal allows you to add and subtract as you like, and experience the change between speeds. 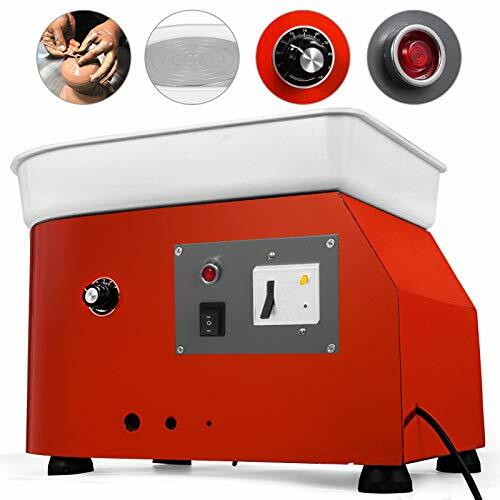 Widely Use: 350W power,this small professional ceramic wheel machine is specially suitable for school teaching and pottery DIY shop, to satisfy professionals and pottery enthusiasts.This machine is suitable for ceramic pottery throwing and shaping process, ceramic teaching and entertainment. Flexible operation; smooth speed; low noise; and forward and reverse switching, etc. Sherill Mudtools Mudsponges are always made in the USA. They are compressed pop up sponges made environmentally friendly material that is incredibly durable. They are excellent for shaping, finishing work, final detail and clean-up of surfaces and won't pull out grog or other materials in the clay body. Natural sponges have been used for years. However, the quality of natural sponges can be unpredictable and there is the issue of environmental pressure on the little guys. Our sponges are compressed for economy of space and for the fun of watching them expand when introduced to water. Compressed for economy of space and for the fun of watching them expand when introduced to water the first time. 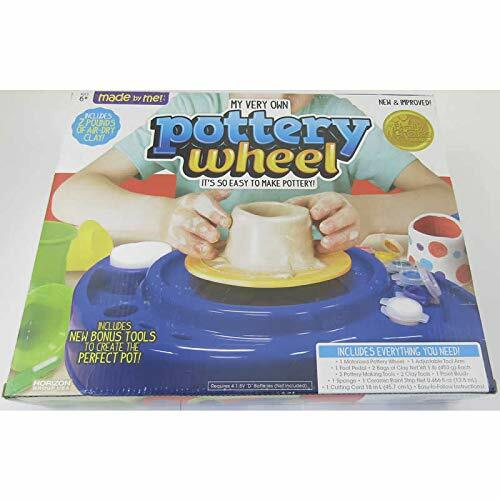 Winner of the 2015 family choice award introduce pottery to your little ones with the new and improved Made By Me my very own pottery wheel! create the perfect pot with the bonus tools, or try making clay creations your own, no baking necessary! make a tea set for imaginary play or just get your hands dirty for a fun afternoon of sensory play with clay. This kit makes a great gift for anyone who is creative and interested in exploring the world of pottery and clay. 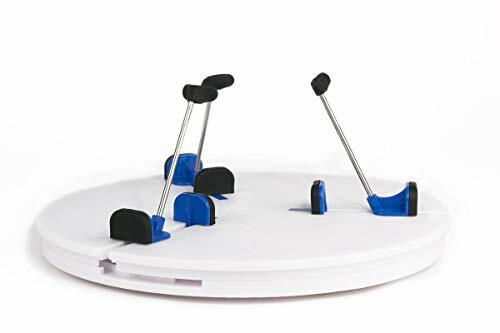 The Made By Me pottery wheel includes a motorized pottery wheel, an adjustable tool arm, a foot pedal, air dry clay, pottery making tools, clay tools, a paint brush, a sponge, a ceramic paint strip, a Cutting cord and easy-to-follow instructions. This kit is recommended for children age 8 and up. 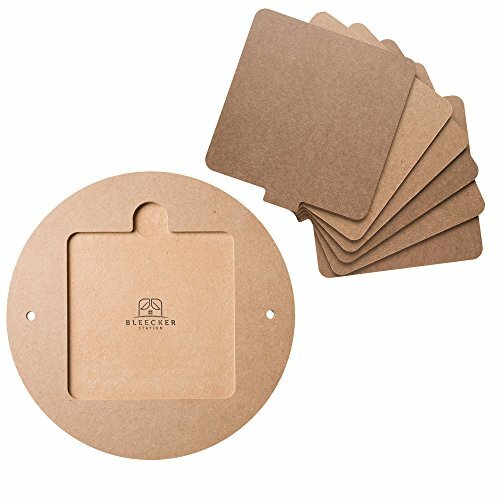 The Made by Me Pottery Refill includes everything you need for use with the Made By Me Pottery Wheel. Use your creative genius to mold and paint your own clay creations. The kit includes (4) 1lb bags of clay, ceramic paint strip, paint brush, glue tube, and easy to follow instructions. This kit is a great gift for anyone who is creative and it is perfect as a solo project or as a group activity for birthday parties, sleepovers and any other fun get-togethers. 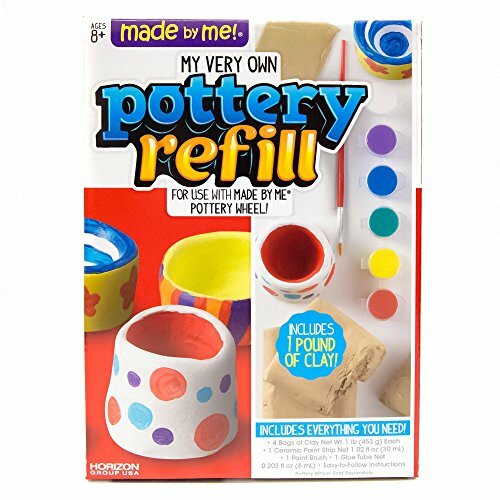 The Made by Me Pottery Refill kit is recommended for children age 8 and up. Made by Me is a collection of classic craft and activity kits that promote creativity and personalization among children. Made by Me products provide opportunities for quality family time, while also encouraging independent play and artistic exploration for children. 1. Roll the clay into a cylinder, fix it in the center of the turntable and press it. 2. Use the ceramic tool alignment center to slowly open the hole, then slightly expand outward a bit. 3. Use ceramic tools to shape and trim the profile of your work. 4. Keep the rotating disc at constant speed and dry the work surface with a spray gun/ hot air gun. 2. Don't rotate too fast and slow at a slower speed. 3. When shaping, you can stretch it out a bit thicker and then thin it out slowly. 4. Use clay tools to assist molding, less water. Made of high quality material, durable in use. Compact structure, light weight, easy to store. Adjustable speed, safe and reliable operation. It has the advantages of stable rotating speed, low noise and energy saving. Suitable for school teaching, pottery bar or home use, meet the majority of professional, amateur ceramic enthusiasts. Easy to use- The bat system is easy to use - no tools needed, fix the outer bat with the wheel pin and insert the inner bats with your finger, all in one second. Water & Wrap Resistant - Unlike others wood bats which can absorb water and easy to get warp, our bat is made of premium hard PVC material, it is 100% water resistant and warp resistant. The inserts can fit into the outer bat well use after use, zero distortion. Standard&Convenient Design - The Outer bat is 11-3/4 round while two holes (3/8) spaced 10 part on center, and one hole (3/8) in center. It fits most standard wheels well such as Pacifica, Brent C, Speedball..etc. The inner bat is 7 square which is wide enough to prevent fingers from getting caught while throwing on the wheel. Space saving - this can save your precious space in your studio by drying your pots on square inserts instead of regular round bats,more space for your creativity. What you get: 1 x outer bat; 6 x inner bats;; 60 days Hassle - Free return and replacement; Lifelong friendly Customer Service. Combining convenience with quality, power and capacity, the Artista Pottery Wheel has it all. The lightweight wheel and compact construction makes it portable and easy to store. Fit for any studio or classroom use by beginners, but professional also love it because of the power it has for a portable unit. Made of high quality material, reliable and durable. 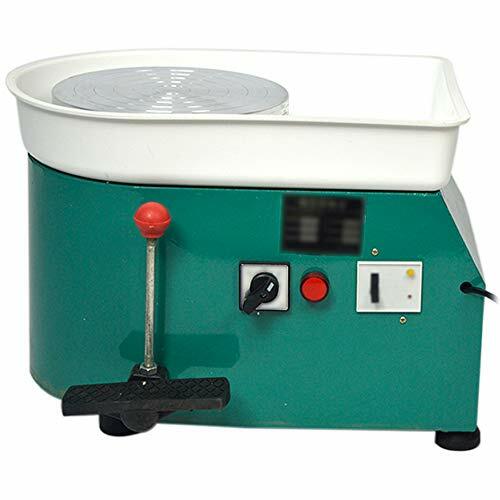 This pottery wheel clay machine is flexible, safe and reliable operation. Suitable for school teaching,pottery bar or home use,to meet the majority of professional,amateur ceramic enthusiasts and the development of design pottery special equipment. 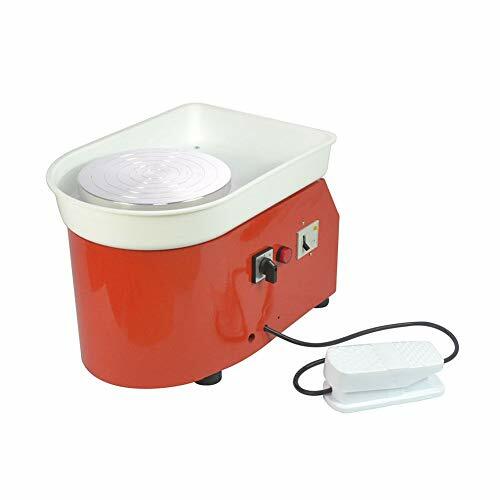 This small professional ceramic wheel machine is especially suitable for school teaching and pottery DIY shop to satisfy professionals and pottery enthusiasts..